The Last Battle of the Civil War? 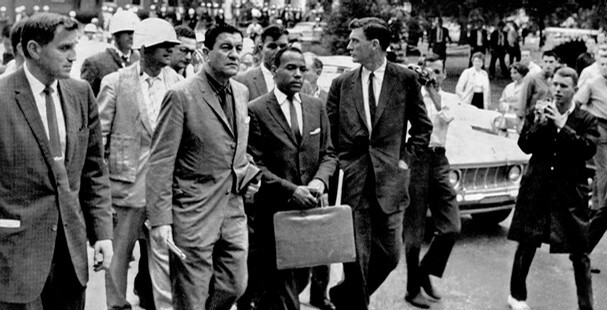 Today marks the 50th anniversary of campus violence at Ole Miss over the admission of James Meredith. Interesting that Meredith enrolled at Ole Miss almost exactly 100 years after the Preliminary Emancipation Proclamation. That Op Ed by Kitty Dumas, who is almost exactly my age, that you linked to is an extraordinary piece of writing. Thank you James Meredith, indeed. When people discuss admissions preferences and support for African American students, especially at southern state universities like Ole Miss and my employer UVa, I like to observe that these very same universities were, until VERY RECENTLY, active participants in a system of state-mandated white supremacy. UVa has been producing the elites in Virginia and elsewhere in the South for almost 200 years – which just might have something to do with the overwhelming whiteness of those elites. Institutions that actively perpetuated white supremacy have a special obligation to fight its legacy. When people discuss admissions preferences and support for African American students, especially at southern state universities like Ole Miss and my employer UVa, I like to observe that these very same universities were, until VERY RECENTLY, active participants in a system of state-mandated white supremacy. The University of Texas at Austin is, this this term of the Supreme Court, defending consideration of race as a factor in admissions, a policy they developed in accordance with a 2003 case from the University of Michigan. The UT admissions system does not have a quota, or award specific points or scoring, but does allow for that consideration in an effort to bring wider diversity among the student body. So there is an irony that UT has long been known as one of the “most Confederate” major state universities, and in the 1940s fought very hard to keep African Americans out of its classrooms. In 1950 they lost Sweatt v. Painter, which opened enrollment in the UT law school to an African American student, and in 1954, just weeks after the ruling in Brown v. Board, named a law student dormitory after William Stewart Simkins, an early member of the law school faculty who had gone on to help found the Reconstruction-era Klan in Florida — a time which he publicly reminisced about every year during a special Thanksgiving lecture to students. The symbolism then was obvious, just as the deep irony of it is now. The ultimate irony of course is that affirmative action itself is discrimination. Contemporary legal attacks against affirmative action, frankly, have nothing whatsoever to do with maintaining a legacy of white supremacy. Has the fight truly ever ended? Discrimination in this country hasn’t ended as we still have those who are living in fear, hate, and pure evilness of others. It went from Civil War right into the Civil Rights war. As one who was was born and raised in Mississippi, I wish to thank Ms. Dumas for her powerful message of hope in today’s Times. Those of us who came of age in Mississippi in the 70s and 80s faced a bewildering society, one suffused with hospitality and hatred, and one that left us all with vivid memories and painful questions. There are many more pages to turn, but the plot line is encouraging. Maybe, but… Martin Luther King, Jr,’s assassination hasn’t happened yet and rural Southern schools weren’t desegregated, under the authority of Federal law, until the 1969/70 school year. Also the Black Panther Party hadn’t been founded yet and their violence extended into the 1970s. Maybe they weren’t a product of the residue of the Civil War though and were something entirely new and different. LSU, my alma mater, didn’t have a group of black students enroll as undergrads until 1964. However, the first enrolled black undergraduate was A.P. Turead, Jr. in 1953. There wasn’t any violence or rioting, but he left the school not longer after. He was not warmly welcomed by many. He had been enrolled only after a court decision. Interestingly a building on LSU’s campus is named after his father who was a prominent civil rights attorney in Louisiana. There had also been a black graduate student enrolled as early as 1950 apparently. The first black graduate student to earn a degree was in 1953 and the law school graduated two black students in 1954. One of my early childhood friends (I spent the night over at their house a few times) is the son of a 1960’s black undergrad at LSU. That man, Ralph Tyson, ultimately became a Federal judge. He sadly passed away just last year. My how things have changed. Hi-five to James Meredith and those that helped him! Thanks for the post, Kevin. I have included the University of Mississippi website about the 50th anniversary, which includes many events going on through the middle of October. In particular I want to draw attention to the event on Oct. 4, “Ole Miss after Meredith: Progress since 1962.” The panel will include Dr. Don Cole, who is mentioned in the Kitty Dumas Op-Ed. Let us honor the struggles of those who came before us by continuing the struggle toward liberty and equality in this nation. I was hoping to hear from you today. Thanks for the information about events at Ole Miss and for passing along the link. I came across it this morning, but never got around to updating the post. Excellent post. Why a epic, moving movie on this utterly fascinating story has not been done yet I have no idea. Two of my favorite books on the subject are: ‘An American Insurrection: The Battle of Oxford, Mississippi, 1962’ by William Doyle and ‘The Past That Would Not Die’ by Walter Lord (what a great title). Lord was a excellent and superb storyteller in the Bruce Catton mold. I also find the account of the conversations going back and forth between Ross Barnett and the Kennedy brothers contained in ‘President Kennedy: Profile of Power’ by Richard Reeves to be riveting. And to think after this potentially destructive event Kennedy has the Cuban Missile Crisis. The two ’60s were extremely historic and insanely turbulent times in American history.